Every once in awhile a book comes along which just amazes me – how do authors do this – grab some thread of an idea and tease it into a plot developing multi-layered characters and themes along the way and then interweaving them all into a lush fabric of something close to life? This is a book about contemporary families and small towns, guilt and fear and love and truth and sibling rivalry along with racism, aging, and even a fairly strong undercurrent of death – how one non-sensical action or event can lead to a whole string of tragedies. What happens is that an awkward and immature boy from a close extended family with emotional difficulties, tosses the head of a pig into a mosque which serves a group of new Somali immigrants in a small town in Maine. 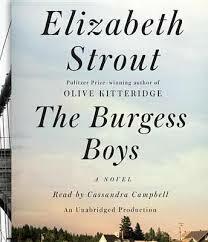 The Burgess boys are attorneys and the boy is the son of their divorced sister. This is deemed a “hate crime” and Zack goes to jail. Stroud gets behind the exteriors of her characters in a multitude of ways. This is generally a third person novel, but many characters, Susan, Bobby, Helen, Abdikaram, Pam and others are presented close up and fairly intimate – we get a pretty good look inside their heads as they agonize over their lives and fear for Zack, the boy in trouble.